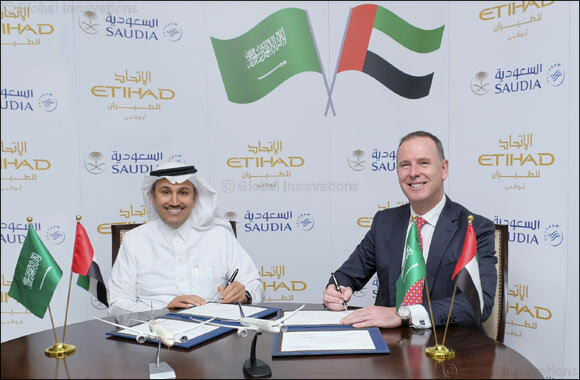 October 22, 2018: Etihad Airways, the national airline of the United Arab Emirates, and Saudi national flag carrier, Saudia, have announced a new codeshare partnership, providing customers with access to more than 40 leisure and business destinations in the home markets and across the world. The codeshare agreement was signed at Saudia headquarters in Jeddah by HE Eng. Saleh bin Naser Al Jasser, Director General Saudi Arabian Airlines, and Tony Douglas, Group Chief Executive Officer, of Etihad Aviation Group. They were joined by Jaan Albercht, Chief Executive Officer of Saudia; Ahmed Al Qubaisi, Senior Vice President Government & International Affairs, Etihad Aviation Group; and Ali Saleh, Vice President Alliances & Partnerships, Etihad Aviation Group. HE Mr. Al Jasser said: “The new partnership broadens aviation and transport links with the United Arab Emirates, building on the extensive aviation investment and strong foundation in the sector. Mr Douglas said: “The ties shared between the Kingdom of Saudi Arabia and the United Arab Emirates are the deepest that the two nations have, and therefore we are extremely proud to play our role and bring the two flag carriers together in this unique partnership. The codeshare agreement will see Etihad Airways place its ‘EY' code on Saudia's flights to, Abha, Al-Baha, Alula, Arar, Bisha, Dammam, Dawadmi, Gassim, Gizan, Gurayat, Hail, Hofuf, Jeddah, Jouf, Madinah, Qaisumah, Rafha, Riyadh, Sharurah, Tabuk, Taif, Turaif, Wadi-Ad-Dawasir, Wedjh, Yanbo, and Abu Dhabi. Port Sudan, Tunis, Alexandria, Sharm el-Sheikh, Multan and Peshawar are subject to Government approval. At the same time, Saudia will place its ‘SV' code on Etihad flights to Baku, Chengdu, Ahmedabad, Nagoya, Tokyo-Narita, Dammam, Jeddah, Madinah, Riyadh, Belgrade, Seychelles, Chicago-O'Hare, and Abu Dhabi. In addition to the codeshare, the teams at the Etihad Guest and Alfursan frequent flyer programmes are finalising discussions which would see members of each programme being offered reciprocal earn and burn opportunities. In the cargo world, the teams in both airlines' divisions are in talks about greater cooperation, recognising the increased volumes of freighter traffic flowing into and out of the UAE and the Saudi Arabia. Etihad Airways Engineering will also provide provide select maintenance services for SAUDIA aircraft at its MRO (Maintenance, Repair and Operations) facility in Abu Dhabi. In 2017 Saudi Arabian Airlines (SAUDIA) carried more than 32 million passengers, registered over 200,000 flights and traveled more than 320 million kilometers, while SAUDIA Cargo carried more than 637,000 tonnes of freight. In 2017, Etihad Airways operated 7,578 passenger flights and carried 1.3 million guests between Saudi Arabia and the UAE. Etihad Cargo carried more than 28,000 tons of cargo between the two countries last year. • Medina: one daily A320 operation. Please note Etihad has additional frequencies published for the Umrah peak in November / December. • Dammam: four daily A320 operations. • Jeddah: three daily operations consisting of: one two class 777-300ER; one two class 787-10; one A320 operation. • Riyadh: three daily operations consisting of: one two class 787-9; one A321, one A320.